After growing up with an untrained dog, I was determined to teach my puppy. The hopes were for a cross between Lassie and Rin Tin Tin. A friendly stranger introduced me to the Dog Owners Training Club of Maryland, and so began our education. Note the name says dog owners training, and not dog training. I had as much to learn about teaching a dog as Praeses had to learn about good behavior. I took everything in stride, even when she talked back during class. And she really did talk back, even as she followed every command I gave her. Our education went so wonderfully, that I decided to enter her in an obedience trial. 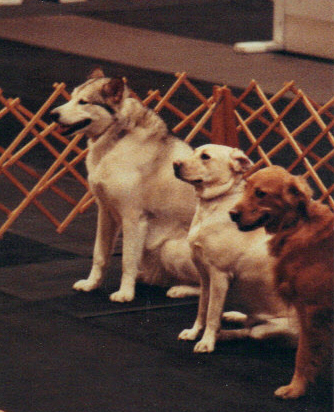 It wasn’t until we had earned the second leg of our Companion Dog degree that someone mentioned that Alaskan Malamutes were supposed to be difficult to train. She came in first place and was even the highest scoring novice at the show. The very next week at what should hav e been our last novice trial, she sat across the ring during the sit stay and turned it into a sit say. I wanted nothing better than to crawl under the mats and hide I was so embarrassed. Needless to say, we were disqualified. Praeses did earn her degree a few weeks later. 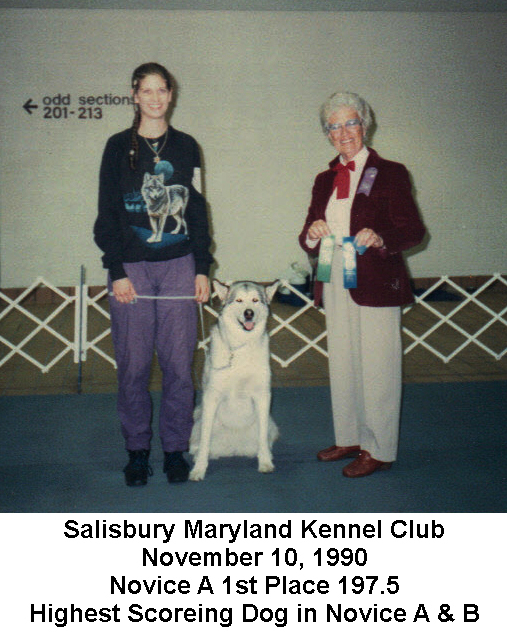 In fact, she was the highest scoring novice Alaskan Malamute in the country for 1990. 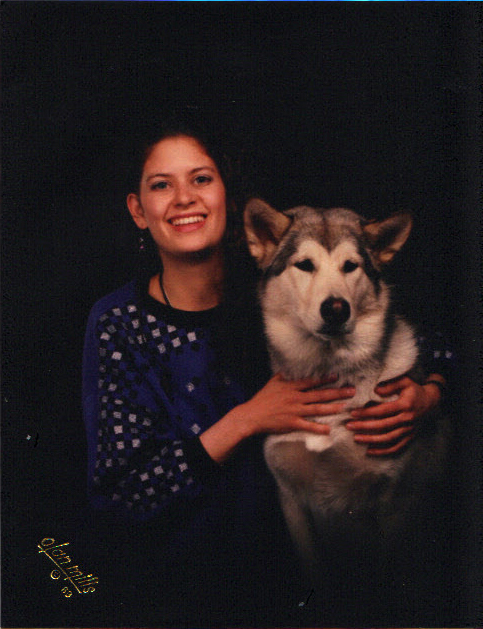 Her picture is published in the Alaskan Malamute Annual for 1991 on page 8. She’s listed as Heljwins Praeses Kaplan CD with a score of 197 out of 200. We hit our obedience wall with retrieving. Wooden dumbbells just weren’t her thing. Neither was bringing things back to me. While we didn’t compete at the higher levels, we did continue going to class for fun. People always asked me if Praeses knew any tricks. Well, I only taught her two stupid pet tricks. She could balance a cookie on the end of her nose and catch it on command. A friend of mine needed a wolf for a movie he was making, so I also taught her to play dead. Praeses was a bit of a ham and did a stumble-stumble fall while doing it, complete with convincing death vocalizations. She was billed as Praeses the Wonder Dog. Ah, the joys of life at an art school. Did I mention she wore costumes? 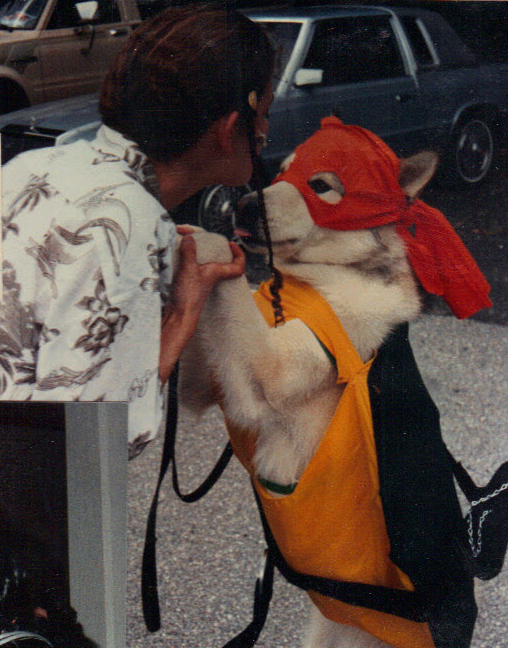 I still have her Teenage Mutant Ninja Turtledog costume in the basement. She was Michelangelo, complete with numb chucks and pizza. Down the street from my apartment was an empty lot which was used as an unofficial off Lead Park. Every morning and evening the local pack would meet up and play. Even as a puppy Praeses knew she would be big and tried to throw her shoulder at the larger dogs. It was rather amusing to watch. Remember that smart little pup who sought out the shade? Well, every time the dog tag/chase game ran its wide circle around the park, Praeses cut across the center to catch the leader. Worked every time. Overall, Praeses was very smart, except when it came to tennis balls. She absolutely loved them…as snacks. In a matter of twenty minutes, while visiting a friend’s house, Praeses consumed three and a half balls. Luckily she was fine, but didn’t feel well for a few days. She also learned to wake me by bouncing her head on my bed. As a rule, Praeses wasn’t allowed on the furniture, but one day when I was sick, she looked at me with those big brown eyes. I could see the question in her eyes asking “can I?” All I did was nod my head slightly and say ok. She was on the bed in a flash and quickly curled up at my feet. Praeses was more than a dog. She was a companion and friend, the anchor that kept me grounded in reality, never allowing my mind to drift careless when I needed to be focused. We moved out of the city when I got married and started a pack of our own. Praeses passed away in her sleep one month before my second daughter was born. This entry was posted in Essay and tagged Alaskan Malamute, animals, Canine, dog, dog lover, Dog Owner's Training Club of Maryland, dogs, Love, Michelangelo, nature, Praeses, Teenage Mutant Ninja, wolves. Bookmark the permalink.